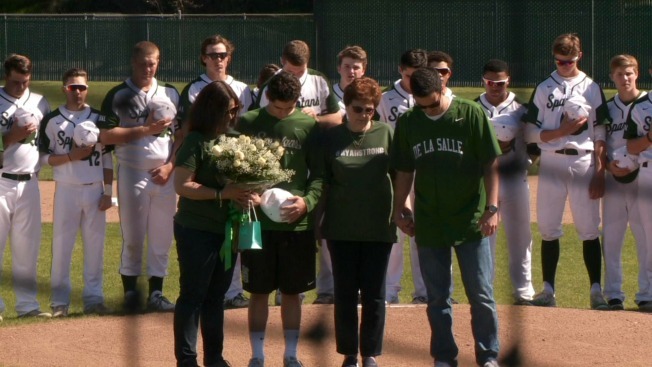 The De La Salle High School baseball team on Saturday paid special tribute to a fallen teammate. Ryan Abele, who graduated from the East Bay school in 2016 before attending the University of Nevada, Reno, died in October after falling down the stairs at a fraternity house, according to the East Bay Times. His former high school teammates opened their 2017 campaign by holding a special prayer ceremony in his honor. "It's an amazing tribute to Ryan," Wendy Abele, Matt Abele's mother, said. "He was a huge part of the team." Ryan's brother, Matt, who tossed out the ceremonial first pitch before De La Salle's opener, remembers his brother as being an "outgoing" and "generous" person with "a larger than life personality." Matt Abele got a tatoo in his brother's memory and said he visits his brother's final resting place regularly. "I just hold myself to that level where he was at and try and honor him and live my life the way he lived it," Matt Abele said. In addition to Saturday's touching moment, the team plans to keep Ryan Abele's jersey in the dugout during every game and wear hats with the initials "RA" stitched into them. The team will also plaster a banner in left field and rename a team award in Ryan Abele's honor.